What a week we've had here. So busy, but productive and exciting as well. Our vegetable garden is starting to wind down with the early hot weather arriving so we've been trying to do a bit of seasonal work here in addition to our normal work. We hope to get another three or four chickens as two of our old girls died recently and we have another two the same age, and therefore not laying. If you know of anyone from Gympie to Brisbane who has some laced Wyandottes, Barnevelders or bantam sussex, I'd love you to pass on their contact number to me. Thanks. 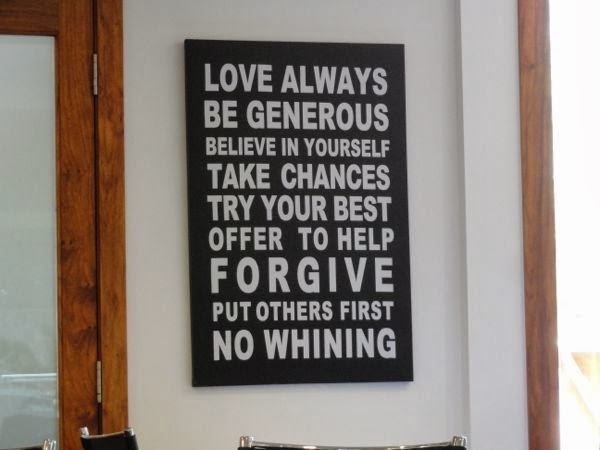 This has just appeared on the wall of our favourite local restaurant, Daisy's Place. I hope you have time to relax after the week's work. I'll see you next week! Six copies of the delightful NZ magazine Sweet Living to read online. Literacy and numeracy: which country tops the league? Blood orange syrup - blood orange also makes a beautifully pink orange tasting icing/frosting for your cakes. I think I may need to acquire some chickens simply so I can make curtains for their nesting boxes!! I'm with everyone else re the unpleasant comments - so sad that some people have nothing better to do with their time. Hope you have a good weekend. Boutique Bantams on facebook have all different breed. Not sure of the exact ones but I know they sell at a few different places. Have a restful weekend, Rhonda. I have a 50th school reunion as it is 50 years since our class left school after completing Junior (the current Yr.10). The majority of us got our pick of jobs in the early sixties so only a handful went on to do Senior. How times have changed eh? I want to get a couple of chickens next year but hubby isn't that keen as we have had them in the past. I'd love to have my own eggs so will have to do some 'negotiating'. They have some 12 week old Barnvelders as well as other breeds with more in the incubator. I do not understand why people come to read a person's blog then feel the need to write hateful things. If something on the blog bothers you just don't come back. I live in Texas. I wish to someday visit your country. It is on my 'bucket' list to do. Thank you for sharing your life with us. I love to see how other people live. People like me who live on a reasonable budget. A quick note to recommend this site on growing spices www.bespokespices.com. I am growing cumin for the first time, we use lots in curries and chilli. Seems to be going well so far. Oh gosh I do love your weekend reading lists, but I have now spent over two hours being mesmerized by your suggestions this week. The sweet living magazine is amazing, and the happy facts made me smile. Thanks for a happy start to my weekend! Just wanted to let you know that I think you are a beautiful soul - inside and out! Hi Rhonda, we get our chickens fromHeritage Hatchery in Archerfield Rd Richlands, they have all the breeds you mentioned and more, they are a family run business. I tried to copy the link to their website but I'm on my Ipad and its being temperamental! If you put heritage hatchery into google their website pops up. They do deliver to both Caboolture and Sunshine Coast - I don't know how much extra it is because they are five minutes from my place. They sell day olds and point of lays - we have a barnvelder - she lays lovely brown eggs, an austalorpe, a Plymouth Rock and a silver sussex plus two indian runner ducks all bought as day olds and all hens - lucky for me. I'm two chickens down as well. Our plymouth rocks were beautiful chickens, talked to me every day, followed me and one of them had even started to jump on the kitchen window sill for a peek inside. Unfortunately they were terribly passive and an easy target for a fox. The brown chicken screeched the place down and saved herself; even scared away the fox but not until he left a path of slaughter along its way. The neighbour lost four chickens and two ducks before it attacked my lot. Such a waste as the fox ended up taking nothing. So sad. I like the sign on the restaurant wall; well mostly. "Put others first" bothers me. My shackles are up; I have for as long as I can remember. And I'm getting tired of it - but - I'm not whining! - just saying. Thank you for sharing two of my blog posts! I'm a new fan of yours and will be signing up to follow your blog. Great so far from what I see. Thanks so much for featuring my blog, A Good Eater, on Down to Earth. I am a long-time admirer of your wonderful blog, and I so appreciate that you included a link to my blog. I haven't commented in a long time but I also want to send out a word of encouragement. It is beyond me why people leave nasty comments when no one is forcing them to read a blog! There are many of us who appreciate you very much. I enjoy your blog so much, Rhonda. You keep me focused and grounded and I appreciate you. I'm don't understand the haters. If you've nothing good to say...well, you know. I've always commented anonymous but will attempt to open an account.